When dealing with groundwater remediation as with most things in life there are various options. Do you want to treat in situ? Do you want to extract the water and dispose off site? Or extract and treat on site? Choosing the right treatment technique can require a lot of site investigation and data collection to decide upon the correct treatment. Once a treatment has been decided upon, approval and licences from local authorities may need to be obtained. Site management and monitoring/sampling regimes will need to be organised. Continual data collection, reporting, a final validation and a final summary report completed. Common practice can be to install an Impermeable barrier to contain or restrict contaminant migration. Ultimately this will not remove the contaminant so a treatment system may need to be installed along with the barrier. How much does groundwater remediation cost? The answer isn’t simple (unlike my blog writing I bet you’re thinking). Read on to get an insight. As with all remediation costs (e.g. 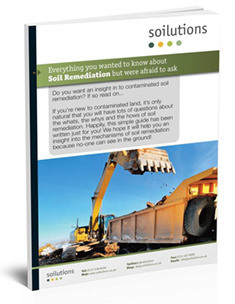 soil remediation cost blog) the process to calculate clean-up costs requires a lot of time with a lot of information. The rate of clean-up is dependent upon many factors in the groundwater and the soils there in. Water remediation can be approached using any of 4 main techniques which are summarised on our web-site here. This is mainly because the hire of equipment and disposal costs are difficult to fix as they depend upon the rate of success. We’ll give you a good indication of time if you ask. In-situ chemical treatment costs are calculated on a cost per treatment basis, the number of treatments can vary significantly as they depend upon rate of treatment success. The size of site, volume of contamination, type of contaminant are crucial for putting together an indicative cost. Phone us and we should be able to at least give you an indication right then, or if you send through some information we expect to be able to do a lot better. Contact 0131 538 8456 and/or info@soilutions.co.uk, or find us here.